"Chi c'è c'è, chi non c'è non c'è" (Who's here is already here, who's not here, s'not comin'). The Despar Perugia have to make good with the players they have and the girls, ready to prove themselves, start off strong winning the first two matches of the season. The team is stronger than was expected and the first round passes in a hurry between well played matches won (Despar 3 - Ravenna 0), and those, unexpectedly lost (Romanelli Firenze 3 - Despar 0). The Despar are "alle spalle delle grandi" (Up there with the big guns) writes Il Corriere dell'Umbria. After many long, hard training sessions and matches, between The Italian Cup, The CEV Cup and League games, The Despar take a short, well deserved break for Christmas and New Year's, to recharge for the second round of the Championship, The Final Four of the Italian Cup, and The Final Four of CEV Cup. Little after the beginning of 2° Round of the Championship, Team Despar are already in difficulty due to unexpected injuries and fatigue (characteristic of the second half of the volleyball season), that the few days of rest aren't able to relieve. A very strong match against Team Modena (Despar 3 - Modena 0) limits the damage caused by badly lost matches against Team Napoli and Team Reggio Emilia, both teams who struggled in the 1° Round. 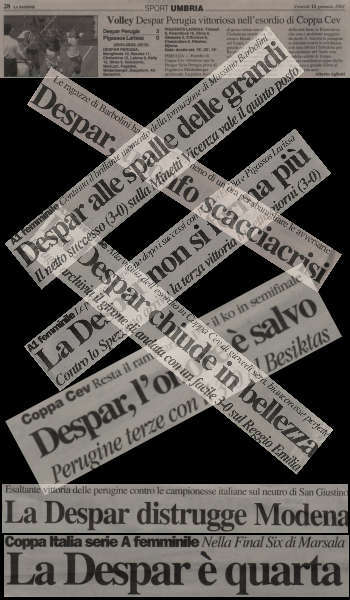 After a brief pause in 5° position, Team Despar would rank 6° for the remainder of the Championship, behind a threatening Team Vicenza who always seemed appear in the most decisive moments for The Despar Perugia. And with that last match, The Despar Sirio Perugia end another volleyball season. A year of many shining moments, and others not so bright. We are not satisfied because there will always be a "What if..." However, to give our all, to do our best, is what they ask of us and all we ask of ourselves. My regrets for what I didn't do last season, and my desire to do better in future Championships, are what drive me to keep on playing this ever-changing game. I Love this Game! !